Ten years ago, the first mirrorless cameras started hitting the market. They delivered the flexibility of an interchangeable lens system, but in a more compact form factor compared to DSLRs. Unfortunately, the early generations lagged behind their DSLR cousins, hindered by performance issues like slow autofocus and poor battery life. Fast-forward to 2018, and mirrorless cameras have changed the game. Not only are they as strong as DSLRs, but if you look at certain reports, they are outperforming them in sales as well. For you, this means there are far more appealing options than before. Whether you’re looking for something that’s capable enough for studio work or compact enough for travel, many models will fit the bill. Here are our current favorites for best mirrorless camera in a number of categories. Mirrorless cameras, in theory, can be faster than DSLRs. Without that mirror, there are fewer parts to move to take a single picture. The Sony A9 is the first to truly put theory into practice. It can run laps around other full-frame cameras on the market, thanks to a 20-frames-per-second (fps) burst speed and a 693-point autofocus system. The A9’s speed is due in part to a stacked sensor — the Sony A9 has one layer for pixels, one layer to read those pixels, and a third layer that serves as short-term memory for those pixels. 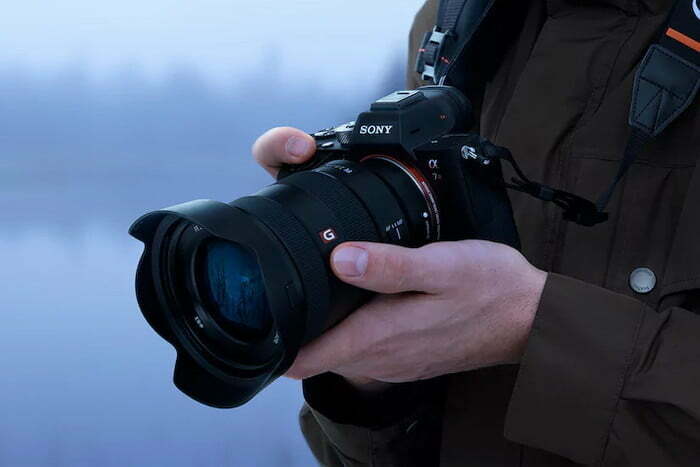 While Sony has launched stacked sensor cameras before, the A9 is the first full-frame model to adopt the technology. It’s 24-megapixel resolution won’t match the A7R MarK III (at 42MP) for detail, but it’s faster performance makes it a much better option for sports and action photographers. While the speed and the quality represent an incredible feat of engineering, the A9 rolls in a number of extras. The electronic viewfinder doesn’t black out while the camera is shooting — even at 20 fps — and the camera can operate completely silently when you want it to, thanks to an electronic shutter. Oh, and because shooting 20 images in 1 second is going to take up a lot of memory, Sony included dual SD card slots, too. The Sony A9 isn’t exactly perfect — there are fewer lens choices than a Canon or Nikon, and there’s that $4,500 price tag — but when it comes to the camera that’s bringing the most innovation to pro-level photography, the A9 is the one to beat. Unless you have the cash to buy the $6,000-plus Leica M, Sony is the only company with full-frame mirrorless options. The A7R III is not the latest model (the recently introduced A7 III— no “R” — is newer, but occupies a lower position in the lineup), but it is still one of the most impressive, replacing the already excellent A7R II. The A7R III was itself a contender for the top spot on this list, having just narrowly lost out to the A9. Compared to previous versions, the Mark III boasts twice the battery life, twice the autofocus speed, and twice the burst rate. Cameras often make a choice between either high megapixel count or high speed, but the A7R III combines a 42-megapixel sensor with a quick 10 frames per second burst rate. Essentially, the A7R III is like a sports car that still has enough room for six kids in the back seat. While the A9 is faster, the A7R III is more of a generalist, capable of performing well in a wide variety of situations. Besides the mix of performance and image quality, the third camera in the A7R series also has an enhanced autofocus system and image stabilization. Much of the design has stayed the same, with the addition of a joystick for easier selection of those autofocus points. Sony has taken the full-frame mirrorless category title every year, with the only other competition coming from pricier Leica rangefinders. And while the line as a whole continues to impress, the A7R III offers the best balance between resolution and speed. 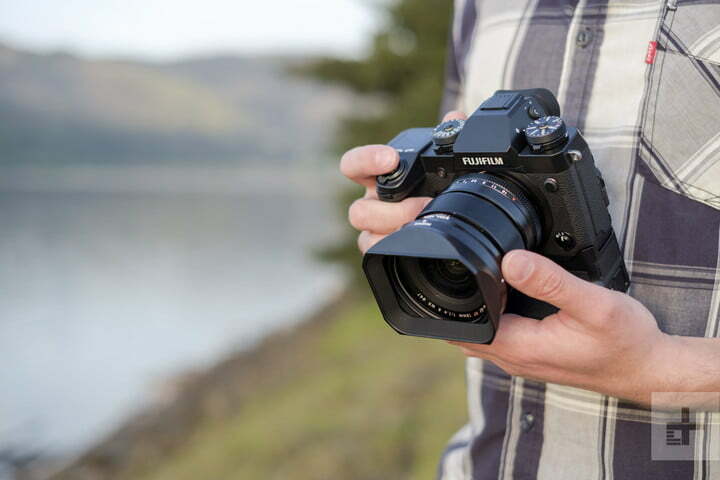 Fujifilm’s X-Trans sensors have long captivated photographers for the detail and color rendering — the Fujifilm X-H1 takes all the image quality you’d expect from a high-end Fujifilm X-Series camera and adds image stabilization, better video, and a more robust design. The X-H1 is expensive, but it’s Fujifilm’s best camera yet and will give entry-level full-frame models a run for their money. The X-H1 is built around the same sensor and processor as the X-T2, our previous pick for this category. That creates a similar image quality except for one big improvement — image stabilization. With up to 5.5 stops of stabilization from a five-axis sensor-shift system, the X-H1 can use slower shutter speeds and a lower ISO in low light. That change further pushes the already great images from the X-T2 into true flagship territory. That stabilization also comes in handy for video, and the X-H1 can now shoot cinema 4K resolution (4,096 x 2,160) at 200Mbps, twice the bitrate of the X-T2. While the stabilization system squeezes out even more quality than earlier models, Fujifilm also focused on the details on the outside too. 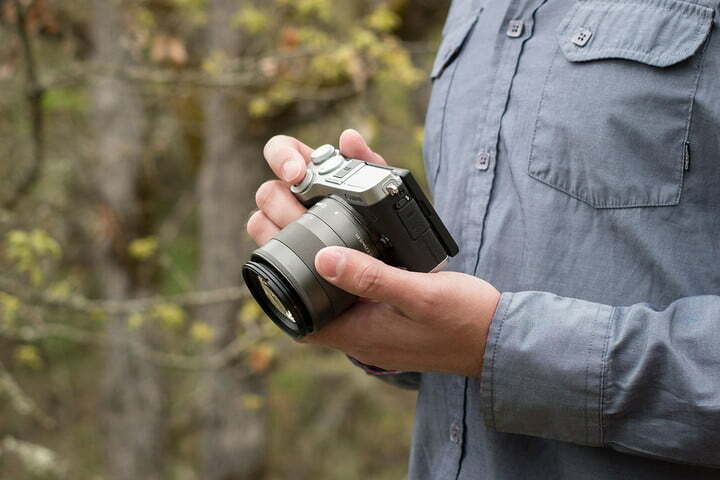 The body of the X-H1 carries a characteristic Fujifilm look but with a more robust build, better weather sealing, and a larger, more ergonomic grip. The body also houses an excellent high-resolution electronic viewfinder, a customizable LCD screen at the top for a quick look at the current settings, and a touchscreen at the back. The X-H1 leaves little doubt as to which body takes that flagship title for the company, but the $1,900 price is also pushing into the range of the lower end full frame mirrorless cameras. 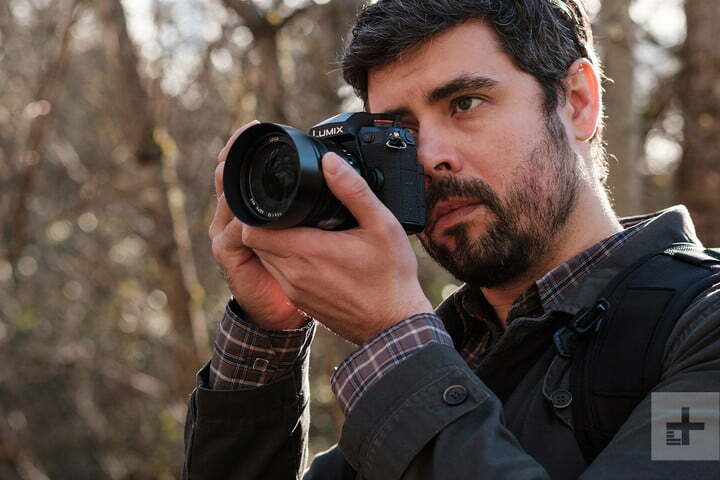 Still, for the fans of Fujifilm’s color and excellent lenses, the X-H1 delivers. 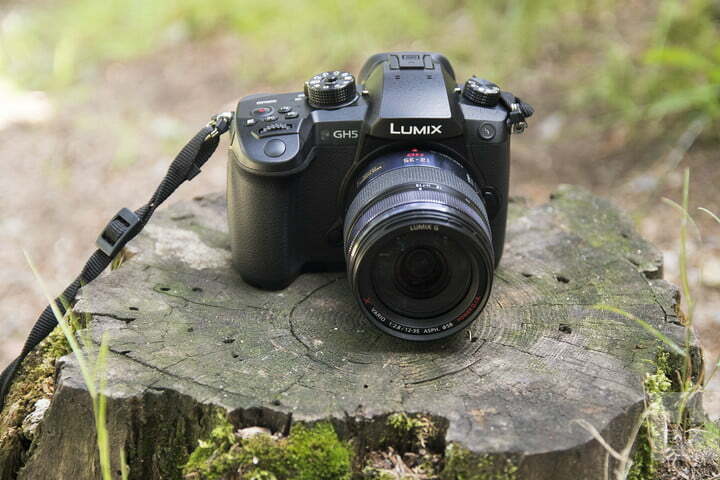 It took a while for Panasonic to catch up to Micro Four Thirds rival Olympus, but the Lumix G9 is a powerful mirrorless camera that can keep up with larger pro-level DSLRs. It features the best control layout of any MFT camera, the largest electronic viewfinder of just about any mirrorless camera, and a sturdy, weatherproof body that lets you take it anywhere. It also offers an impressive in-body stabilization system that works in conjunction with stabilized lenses for a maximum of 6.5 stops of shake reduction. Its smaller, 20MP sensor may not match the image quality of the APS-C and full-frame competition on this list, but the Lumix G9 makes up for it with incredible speed. It can shoot up to 20 frames per second with continuous autofocus using the electronic shutter, and also offers both 4K and 6K photo modes for continuous, uninterrupted shooting at 60 and 30 fps, respectively. And if you need more resolution, the camera can merge an 80MP image from eight separate frames with its High Resolution mode. Of course, it wouldn’t be a Panasonic without a great video mode, and the G9 doesn’t disappoint here, either. It may not offer the pro-level features of the GH5 and GH5S, but it can still shoot 4K video at up to 60 frames per second, and it doesn’t impose a recording time limit like most other hybrid cameras. At around $1,700, there are many APS-C and even some full-frame competitors to be found at similar prices, so while the camera is excellent, the investment isn’t for every photographer. Interested in an even more compact and stylish MFT camera that won’t break the bank? We recommend taking a look at the Olympus OM-D E-M10 Mark III. Why should you buy this: The GH5 is a hybrid camera that’s can shoot both stills and video without cutting corners. Who’s it for: Creatives who shoot both stills and video. While video is a big selling point for the GH5, the camera can hold its own among other Micro Four Thirds shooters for still photos. The five-axis image stabilization plays a role for both videos and photos, the autofocus is quick, and still photos are as fast as 9 fps with continuous autofocus or 12 fps with focus locked on the first frame. The GH5 also has several Panasonic-exclusive features, including 4K and 6K photo modes where you can choose the focus point after the shot, merge several images together for a deeper depth of field, or shoot reduced-resolution still photos at 60 or 30 fps, respectively. Like the hybrid photo-video capabilities, the GH5’s body feels more like a DSLR/mirrorless hybrid. It’s smaller than most DSLRs, but there are plenty of physical controls, a great electronic viewfinder, and dual SD card slots. While you can buy cameras with larger sensors for the same price, the GH5 has the best mix of photo and video options we’ve seen yet, and outclasses many cameras costing much more when it comes to pro video features. Why should you buy this: A beginner-friendly camera with a beginner-friendly price tag. Still reeling from the four-figure price points of the best mirrorless cameras? While the growth of the mirrorless ecosystem means there’s now a pro-level performer in every category packed full of incredible features, camera companies aren’t leaving entry-level users behind. The Canon EOS M6 is a beginner-friendly camera that you can pick up for around $800 with a lens. The M6 shares the same sensor as the pricier, more advanced EOS M5, which means image quality is identical to the higher-end model — and we always love to see budget cameras that don’t skimp on image quality. The build quality is also similar and feels solid and durable in the hand. So if image quality and build are similar, what did the M6 give up to hit that price point? It ditches the electronic viewfinder of the M5, leaving only the LCD screen for composing your shot. Like the M5, there’s no 4K video, and since Canon was a bit late to the mirrorless game, there aren’t as many lens options compared to other brands. Canon’s new EOS M50 offers 4K for a similar price point, but only at 24 frames per second. The Fujifilm X-E3 is another lower-priced option that has an edge on the M6 is some areas, like its 4K/30 fps video mode, but it costs another $100 more. Mirrorless cameras have come a long way since the first models, and nearly all are now capable of producing pleasing images. To find the best models, we factor in criteria such as image quality, speed and autofocus performance, low-light strength, video features, durability, and any unique aspects that help them one-up the competition. Our selections are based on our long- and short-term testing; experience with earlier models; familiarity with the companies’ technologies; consultation with industry experts, fellow journalists, and users; online forums; lab results (such as DxO); and other third-party reviews. We look across the board — not just our own experiences — to find consensus on what we think are the best-performing cameras you can currently buy. We also look at list pricing to determine if a product is worth the cost. The camera market evolves constantly, with manufacturers often introducing better models with new features. So, you can expect our picks to change over time. But don’t worry: The models you see here will be with you for some time, and if we anticipate there could be better models in the horizon, we will state that upfront to help you decide whether you should buy now or wait. A mirrorless camera is a type of camera that uses interchangeable lenses, also called (to a lesser extent) a Compact System Camera. It’s related to the digital single lens reflex (DSLR) camera, but do not confuse the two as the same. DSLRs use mirrors to reflect light from the lens to the optical viewfinder (OVF). When the shutter button is pressed, a mirror flips up to allow light to hit the sensor. Mirrorless cameras do away with the mirror system and OVF (hence the name), allowing for lighter and smaller designs (although professional models can be somewhat bulky and heavy). But like DSLRs, mirrroless cameras let you attach a variety of lenses and typically use larger sensors than point-and-shoot, fixed-lens cameras, which leads to superior image quality.